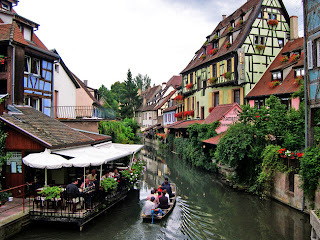 Colmar is a medieval town situated along the Alsatian Wine Route. During your walking tour you will see remarkable half-timbered framed houses, the German influenced old quarter filled with streets of unexpected twists and turns, canals and the Launch River. Some think about Colmar as a village. No! It's a capital. The capital of Alsatian wine. 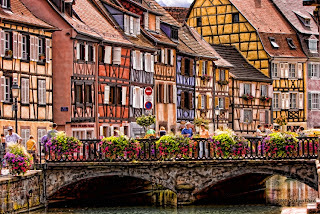 Cheery, good natured, lively and breathtakingly beautful - it's well worth taking a discovery stroll through Colmar It's a country city, the kind Alphonse Allais dreamed of. Built in the country, on the Ried plain, the banks of the Rhine at its doorstep, the line of the Vosges mountains like a sentry watching over it, with the Fecht and Lauch rivers to gaze in. 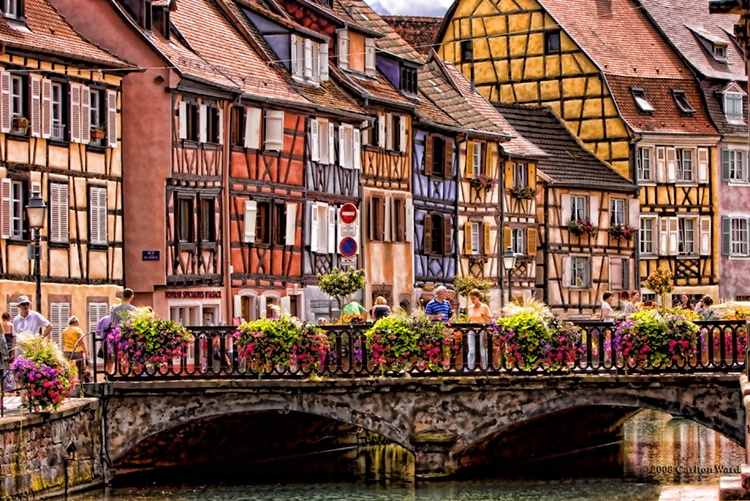 Colmar offers visitors an exciting glimpse of 1000 years of European history. Besides, with its 67,000 inhabitants, it retains a country town atmosphere which contributes so much to its charm. Wonderfully preserved from the ravages of time, its homogeneous historical center is classed as a protected area and has benefited from careful restoration and ongoing improvements for more than 20 years. While on the market place, make sure to visit a "Creperie" and have one of these delicious crepe! Lots of legends and stories are being told and I want to share with one with you. Hercules, the half-God, on his way back from the garden of Hesperides, found himself in the region between the Vosges and the Rhine, that would later became Alsace. It was late, hot and he was thirsty. He decided to halt and drank local wine that was (already) good. Entering an inn, he downed vast quantities of the local wine which was reputed even then and thereupon fell into a deep sleep, hes head spinning. When he came to the next morning, his head was aching and he saw that his herd had run off during the night. Rushing off in hot pursuit, he left his club behind. The locals, with their love of all things tidy, eventually placed the forgotten club in the town's coat of arms. This probably explains why, for as long as can be remembered, the inhabitants of Colmar have been known as the Kolbnarren - the mad clubmen.